A Bradford man has been charged with burglary and the theft of a Mercedes Benz in Harrogate yesterday. The vehicle was later involved in a police pursuit and crashed with two other vehicles in Pool-in-Wharfedale. 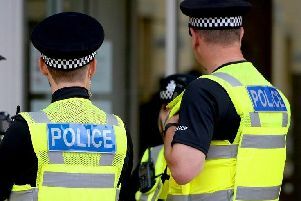 North Yorkshire Police said the 22-year-old man is suspected of breaking into a house on St Mark’s Avenue at around 3pm yesterday. It is believed the key to grey Mercedes was stolen from the house, which is often known as a “2 in 1 burglary”. The owner reported the break-in and theft to North Yorkshire Police at 3.09pm after returning home from work. It triggered a police operation to track the stolen vehicle down. A police spokesman said: "Officers in an armed response vehicle sighted the Mercedes as it travelled over the West Yorkshire border into Pool-in-Wharfedale. "A short pursuit entailed on the A658 near Pool Bridge which resulted in the arrest of the man and the recovery of the stolen Mercedes at 3.35pm. "However, the Mercedes was involved in a minor injury collision with red VW Golf and a red VW Polo before it came to a halt." The road was closed while emergency services worked at the scene and eventually reopened at 8pm. The driver of the Polo, a 65-year-old man, received treatment to a shoulder injury. A police officer also needed treatment at Harrogate District Hospital. He suffered a knee injury during the arrest after the suspect ran into a field. The officers has been signed off duty for 10 days while he recovers. The 22-year-old man questioned and charged with burglary, theft of a motor vehicle, dangerous driving, and driving without a licence or insurance. He appeared at Harrogate Magistrates’ Court this morning and was remanded into custody until a hearing at York Crown Court on October 9.